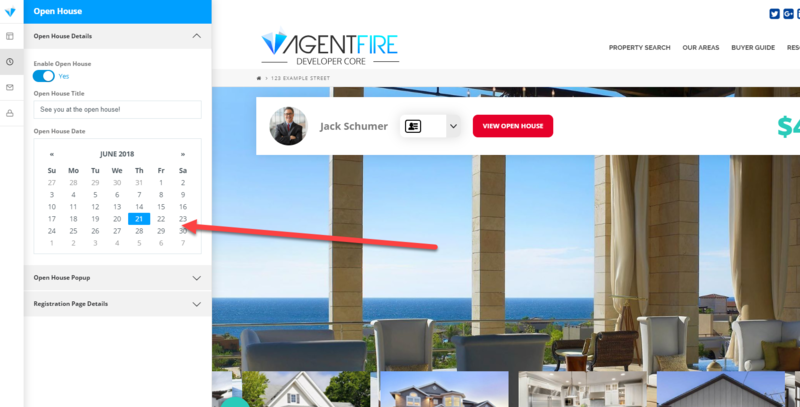 With every listing you create, it's easy to enable visitors to register or pre-register for the open house you have scheduled. Open houses can be a great way to attract potential buyers and build relationships which can lead to additional transactions. They also are a valuable part of showing the seller your determination to get their home sold. 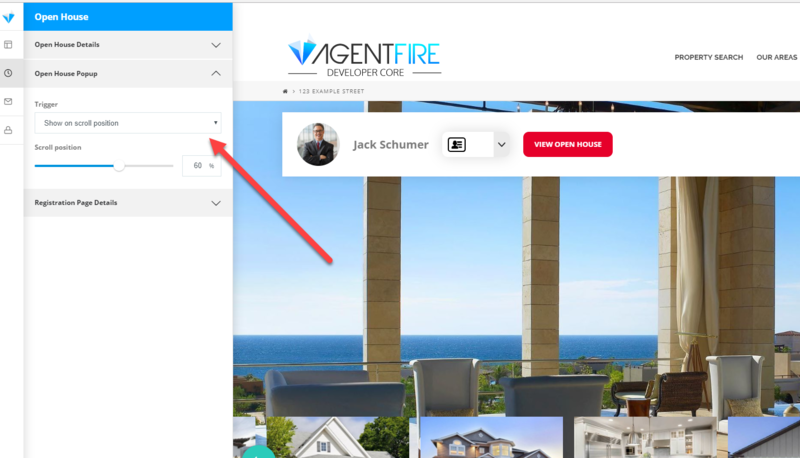 When you have an upcoming open house, it's easy to enable online registrations for a listing using our Open House capabilities! The open house registration component can be used for both pre-registering ahead of the open house, as well as onsite the day of the open house. Below we'll outline how to setup and deploy your open house, as well as how to use it onsite. If you are looking to perform onsite registrations, configure the open house registration settings below and then continue through the registration page instructions shown. Open the Open House Details category to enable the sign up options. Your open house is easy to set the date with a handy calendar and an editable Open house title. Set the date of your open house. 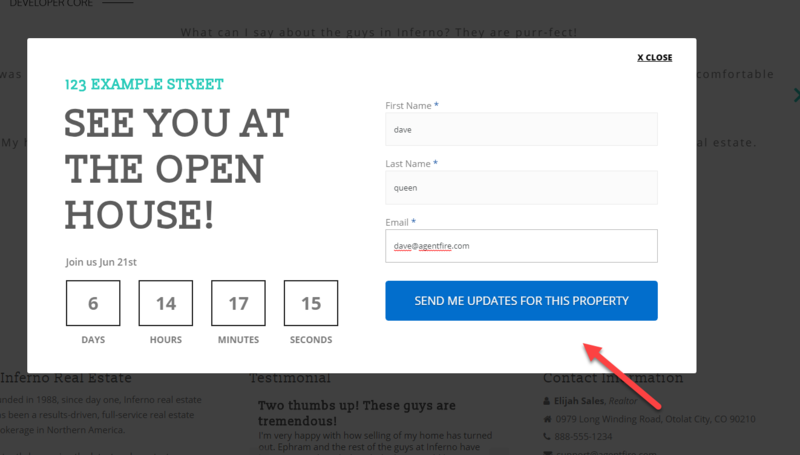 With your open house date entered, your open house modal is instantly available on the page. You'll see a new red button appear next to your contact information in the top bar. 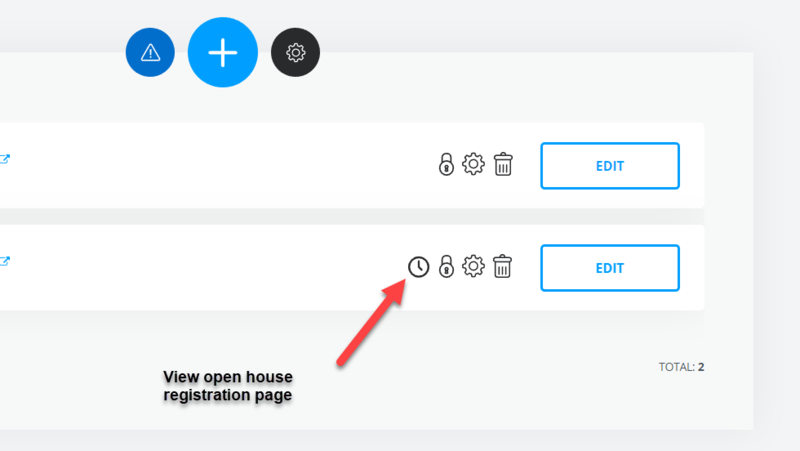 With the modal opened, you can see that a form is instantly created, and your open house title is displayed in the opening with a count down until the date of the open house. Next up, we'll head to the Open House Popup settings. Here we can control how the modal appears for users without pressing the View Open House button. Delay: This trigger displays the modal after a set amount of time. Exit Intent: This trigger displays the modal after a user has moved their mouse/cursor outside of the browser window (Example: To reach for the back button). Last, we're going to configure the Registration page settings. This is a separate page overlay available for use with a tablet, laptop or other electronic device that you want to make available onsite the day of the open house. To use the registration page, add ?r to the end of your listing url. 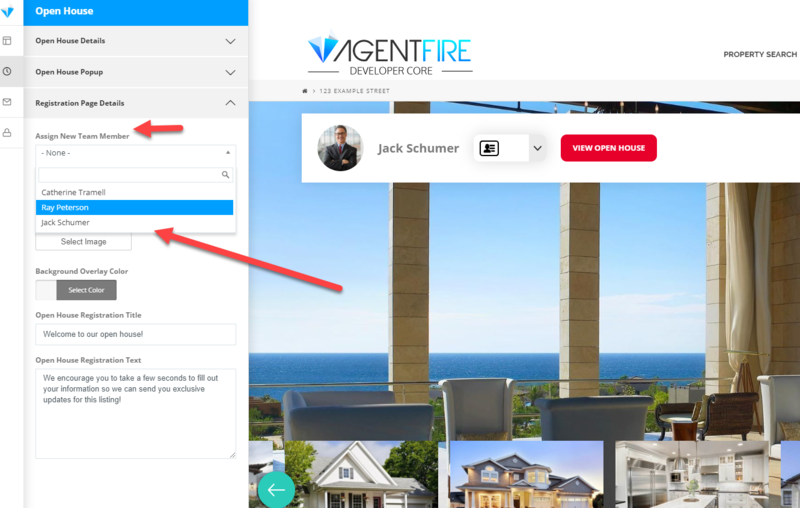 You may also reach this page by visiting your listings list and clicking the timer icon near your listing settings to open the registration window in a separate tab. Open your Registration Page Details tab. If a specific agent will be onsite for the open house, you may select them here to assign all lead entries for the open house pre-registration requests as well as onsite registrations. Their team member profile image and name will appear on the registration page similar to the example above. 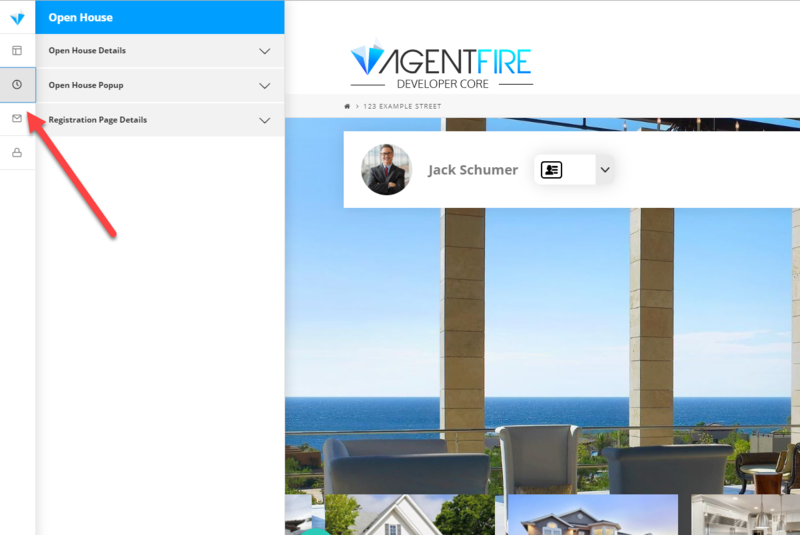 Your registration page will also have an area for a background color, or background image, or background image with cover overlay displayed behind the agent profile. You may save your overlay and check the results on the registration page until you have the desired effect. Simply add ?r to the end of your url. You may make use of the "open in new tab" features in your AF editor to view the listing in a separate tab easily. 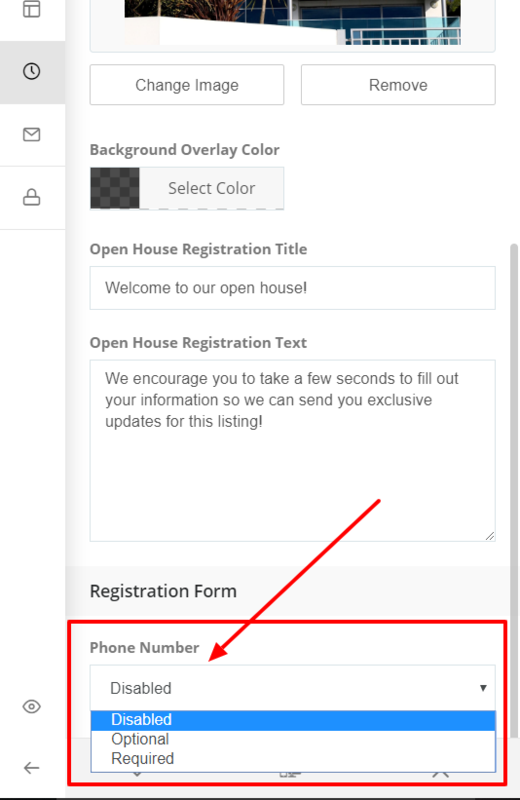 You can enable to a phone number field to the registration form, which can be set to Optional, Required, or Disabled (default). Curating leads with your listings is easy with the built in social locker component. Require your visitors to see the page contents after they have registered via facebook, google+ or via email. Navigate to the "View All Lisitngs" area and click to highlight the lock symbol. 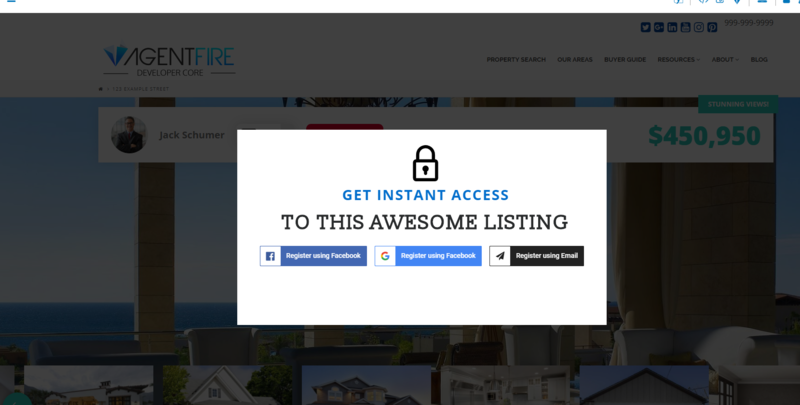 With this feature enabled, your users will be required to register prior to being allowed to view the listing page contents. 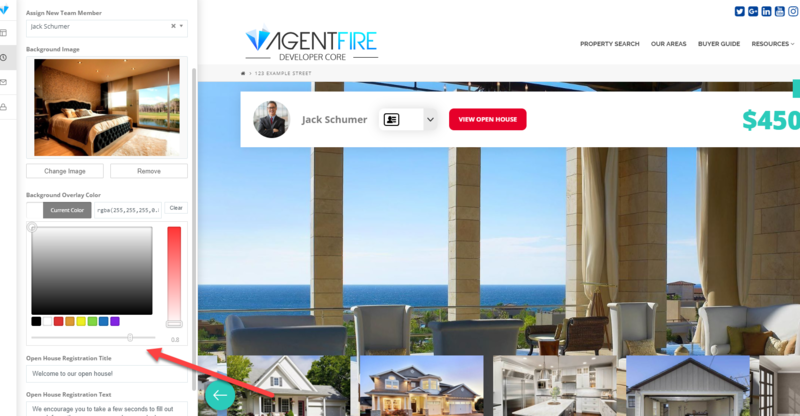 An excellent way to generate leads on listings with lots of user activity! View the resulting listing URL after you have enabled the lock to confirm that the social locker is displayed.